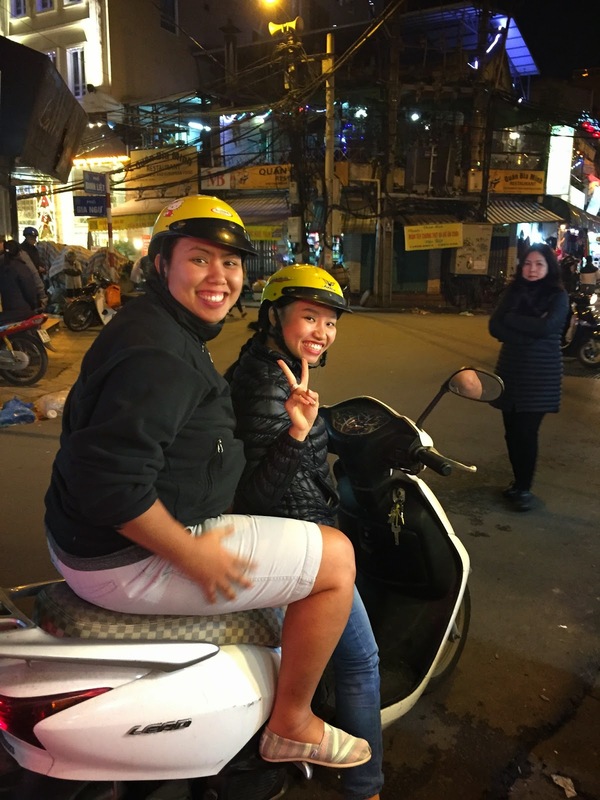 The manager of the Hanoi street food tour and two young women with helmets were outside our hotel when we arrived ready to whisk us away. We paid the manager for the tour and never had to worry about paying for any of the food we ate again all night (and you'll soon read about just how much food that was)! Our two very friendly Vietnamese guides quickly introduced themselves as Amy and Lotus (guessing these were their English names). They carefully put the helmets on our heads, buckled the strap, helped us get on the back of the scooter and before we had time to do a Hail Mary we merged out into the chaotic traffic of Hanoi. Initially we had wanted to drive our own mopeds, but quickly realized if we wanted to live any longer, it was best that someone else drive. Hanoi's traffic rules seemed non-existent to us foreigners, but the longer we were in the country we observed it was a well-timed and practiced art of lane changes, honking and calculated risk. 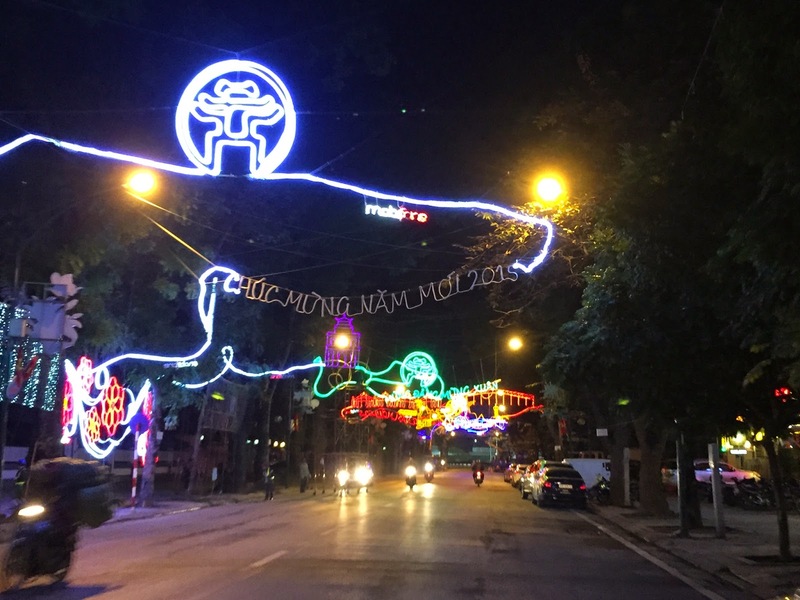 So off we went, wide-eyed and excited to begin this night of exploring Hanoi’s Old Quarter and a guided tasting of the city's best street food. 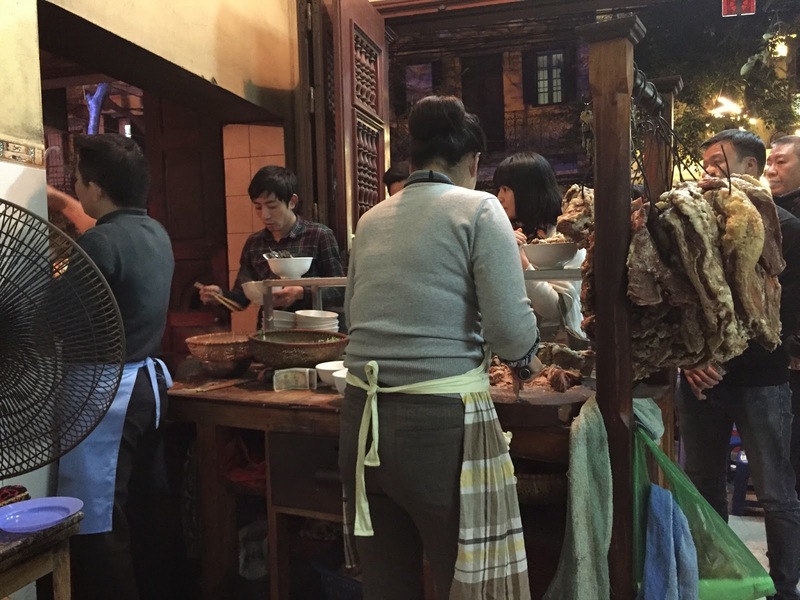 What we quickly experienced was Vietnamese street food is quite different from what we Americans deem street food. New Yorkers have food carts scattered across the city offering a quick hot dog that’s been simmering for hours in a hot tub on wheels. Ballparks across the country have street vendors littering the streets outside our grand stadiums offering quick grab and go bites before you head inside to watch the game. In Seattle, where our food culture centers around what else— coffee shops, we duck in for a quick snack while we order up our morning latte to warm up before heading to work. Street food is common at fairs and festivals (oh funnel cakes and deep-fried twinkies), but the main vehicle for street food is literally a vehicle— the now common food truck. 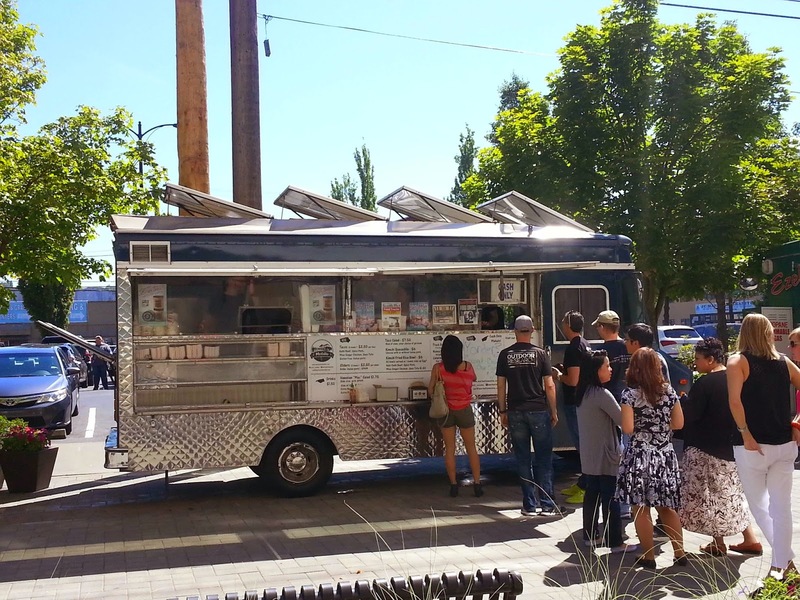 These trucks are all around our city offering cuisines as varied as you can dream up (we love Marination's Big Blue (fusion street food featured on our Alki Tour) and the Tat's Deli truck (Philly cheesesteak featured on our Pioneer Square Tour). 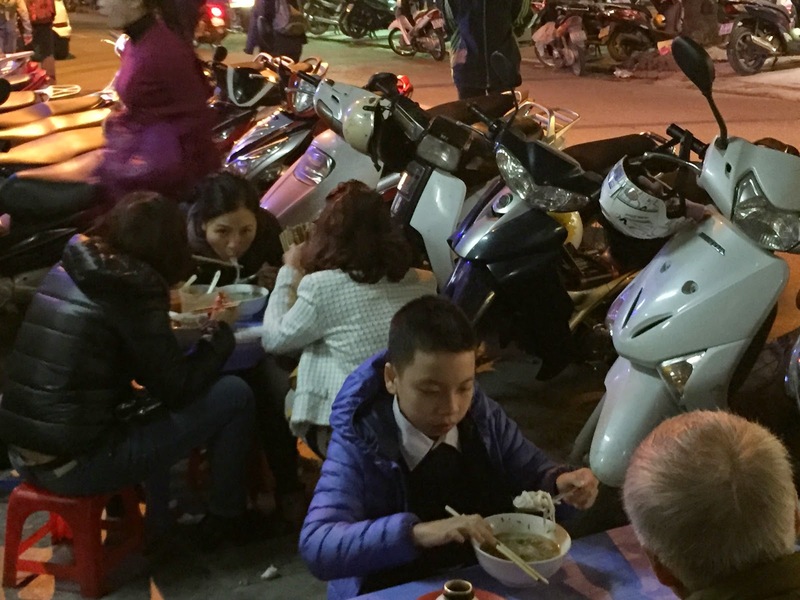 Vietnam’s version of street food varies greatly from the American. Instead of a bright, painted, rolling marketing billboard (aka food truck) rather in Vietnam you find street food in stalls, women with make-shift carts or carrying baskets fashioned together with whatever materials are available (sometimes as simple as a bamboo sticks). There are also traditional store-fronts, nothing special to look at, in fact you would probably pass the best places right by unless you had the inside track like we did with our two expert guides. What we were about to experience was that the food deemed street food also didn’t need to be fast or portable, in fact we were going to start our tour with a bowl of soup. 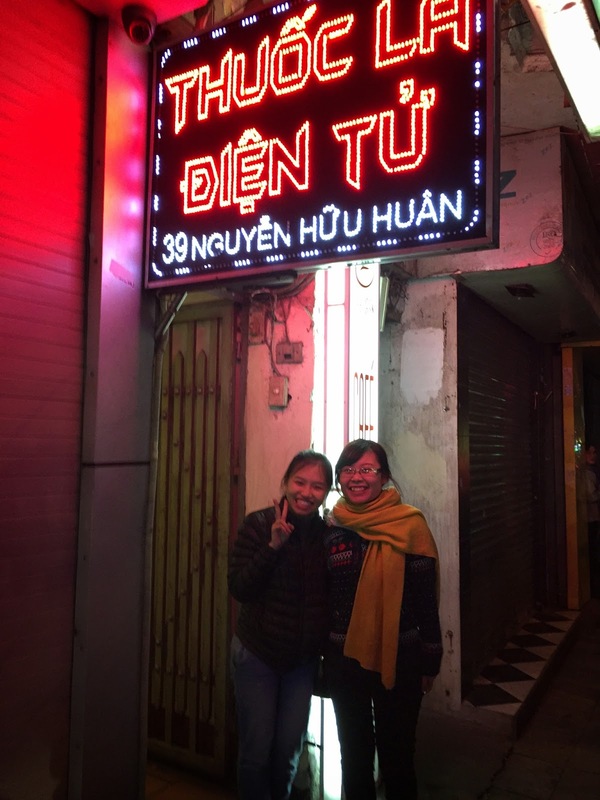 We stopped first at Phở Gia Truyen (49 Bat Dan Street), which was not much to look at and would be one of those restaurants we would have passed right by as a tourist. Lotus quickly guided us to one of the handful of communal tables available while Amy went to get our bowls of phở (pronounced “fuh”). When the bowl of noodles arrived, Lotus gave us careful instructions on which of the condiments to add and exactly how much (her mission was us eating the perfect bowl of phở ). They both watched us intently from across the table, so eager to determine if we loved this bowl of noodle soup as much as they did. After a few slurps of the deepest, most flavorful broth either of us had ever tasted, we did crown this bowl of phở the best we’ve ever had. This of course pleased our guides immensely. We asked what the secret was and their answer was years of practice, having been in business for decades (our guides said their parents had been coming here their entire lives). The other secret, start the broth early in the morning and let it simmer for most of the day. Amy said that every phở traditionally has the same seven base ingredients, but it’s how you prepare it and balance the flavors that makes the special ones stand out. 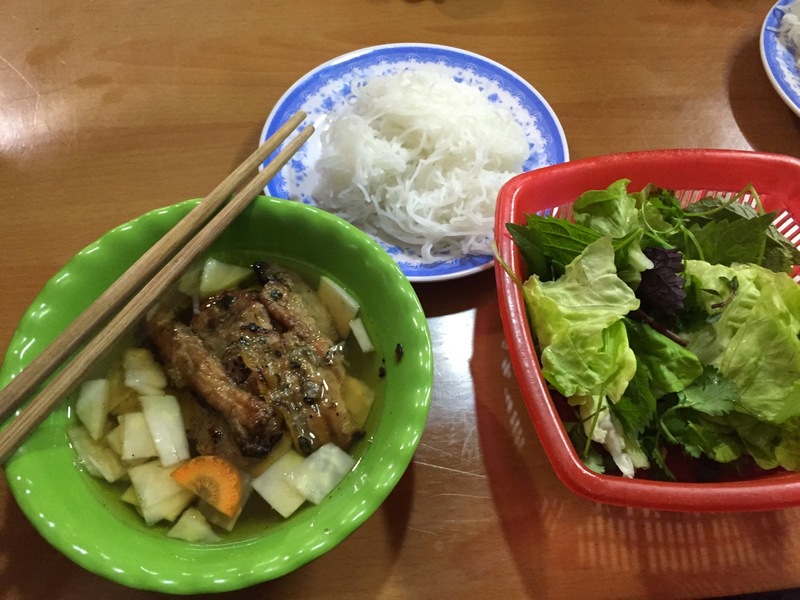 It was apropos that we began with phở as it’s believed to have originated in Hanoi. We have a large Vietnamese community in Seattle (inclusive of Little Saigon in our International District) so we’ve had our fair share of phở normally for lunch and sometimes for dinner. 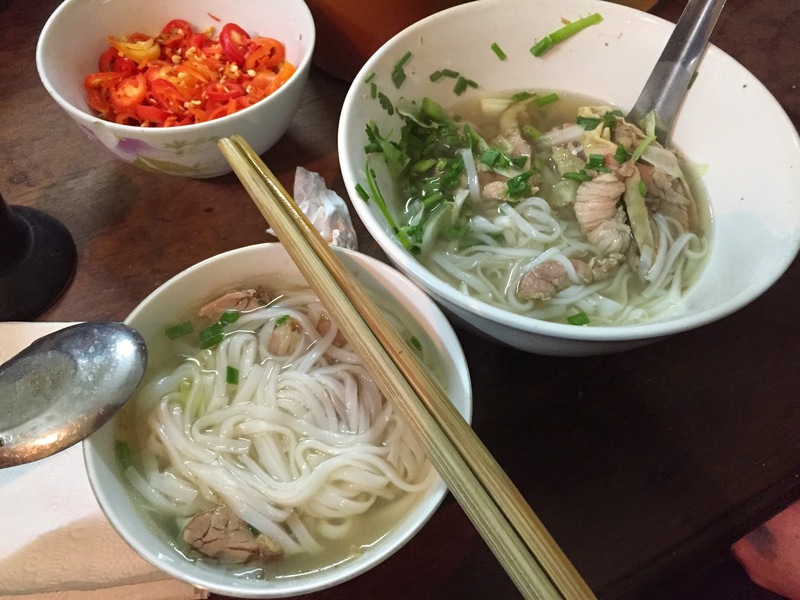 We quickly learned at our first breakfast in Vietnam that phở is the breakfast of champions here and commonly eaten out on the street at little stands. In comparison to the phở we’ve tried back at home, this bowl definitely stood out because of the silky homemade noodles, but it really came down to the broth. 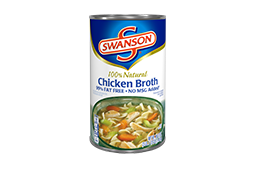 Broth to our generation has traditionally been that can of Swanson grandma gets out of the pantry for Thanksgiving cooking. 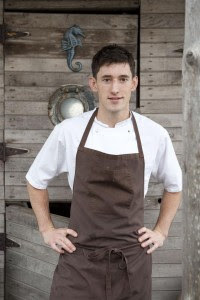 However, more and more home chefs are discovering the secret to making their soups and other dishes more rich, is by making their own homemade broth (it’s much healthier too). Speaking of broth did you know this under-appreciated liquid gold is becoming extremely trendy in the United States? Brodo (Italian for broth) in New York City is leading the charge by marketing the health benefits of broth while appealing to our American on-the-go culture. They offer paper cups filled with piping-hot broth for the sipping, allowing customers to walk the streets of New York with their hands around some old-world warmth. We may never be able to replicate that authentic phở experience back in the states even though it can be found across the nation. There’s really no way to replicate the environment where you tasted that perfect bite. It's the entire sensory experience that adds to the flavor and gives the food that specific taste you can only find by eating it at the origin. Elements like the weather (in this case hot and muggy even at 6 pm in the evening), the sound of a foreign language being spoken around you, the smells of unfamiliar scents and seeing the hustle, commotion and sounds from the street. All of this combines into the taste and memory of the food. Despite knowing this, we still vowed to try to research some recipes for Pho Bac (traditional Northern Vietnamese phở) and try to have some of this wonderful soup for breakfast one weekend morning. 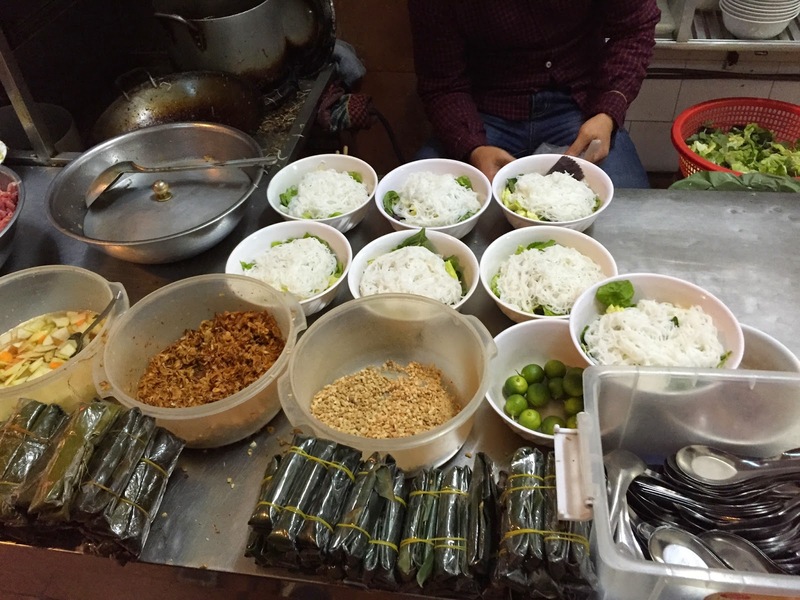 As we discussed phở with our guides they were quick to point out that there is a gaping divide between how it’s made in the North vs. how their counterparts in the South prepare this national dish. Lotus bluntly shared that her people, the Northerners, are lazy and don’t like to exercise so they keep their food light and healthy so they can get away with that laziness. Southerns are a little more indulgent and heavy-handed with their phở. She promised we would try both varieties so we could compare. Sadly, we knew we had to move along from this delicious stop. As delicious as phở is, it only scratches the surface of Vietnamese street food and this was just our first stop with many more to go. It became apparent we were going to have to pace ourselves as this was a food marathon, not a sprint. 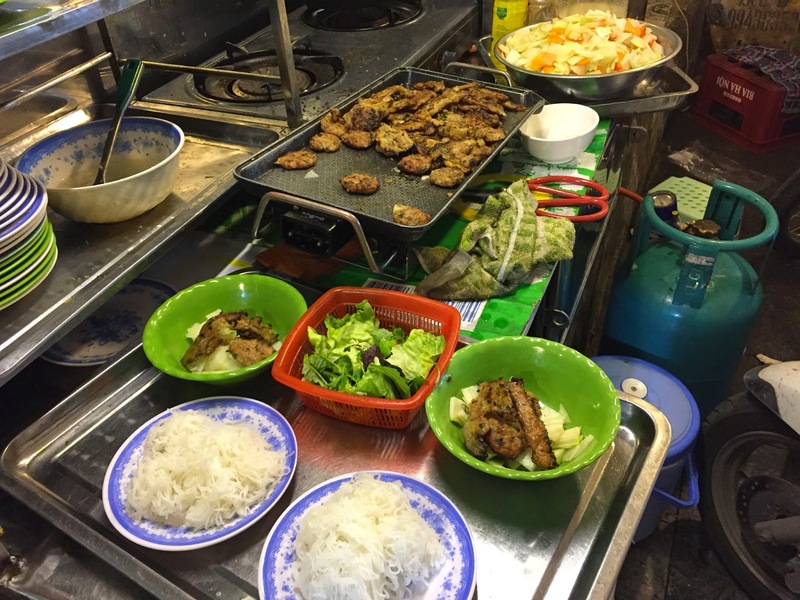 Next it was on to try another dish also said to originate in Hanoi, Bún chả, which is a grilled pork kebab (chả) served with rice noodles (bún), traditional herbs and dipping sauce. It is typically eaten for lunch, but was part of our night's extravaganza. The pork is grilled and then placed in a light broth that tasted both sweet and sour, which complemented the pork very well. The noodles, herbs and usual suspect condiments are to be placed in the broth as additions. We enjoyed this dish and it would have been one we would not have known to try on our own. 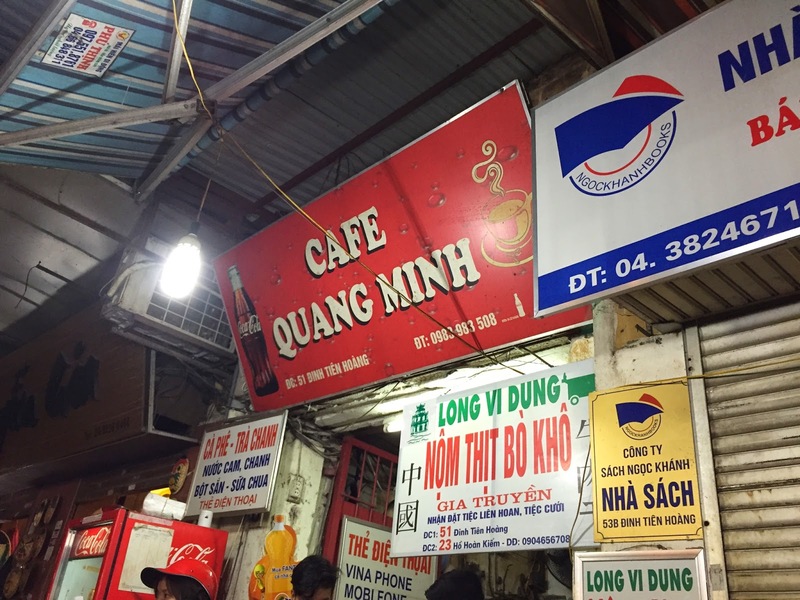 Next, it was onto Cafe Quang Minh (51 Dinh Tien Hoang). We found parking for the mopeds and then our guides quickly seated us at one of the small, teeny-tiny tables that might be found in a child’s room back in the states. Amy dashes off and brings us back a popular snack named nộm bò khô (green papaya salad). Don’t let the name fool you as it did us, it sounds so cool and refreshing, but is actually a very complex combination of flavors. The salad is sweet and spicy from the thin slices of beef soaked in a mixture of cane sugar, garlic, oil, ginger and chili, which is soaked overnight and then oven dried. Sour from the julienned green papaya pickled in vinegar. 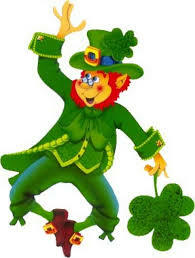 There’s a freshness from the herbs and crunch and saltiness from the peanuts. It’s all tied together with a dressing base of fish sauce, sugar, vinegar, chili, seasonings and soy sauce. 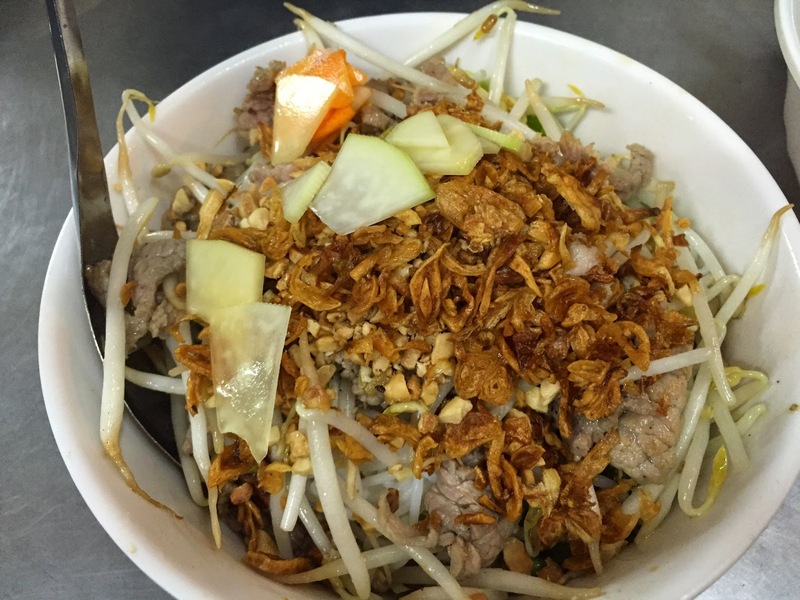 The Vietnamese are masters of finding a perfect balance of flavors in their cooking. delicious sandwich) was introduced during French occupation. The fillings however are very much Southeast Asian; pickled carrots and daikon, hot chili peppers and herbs. 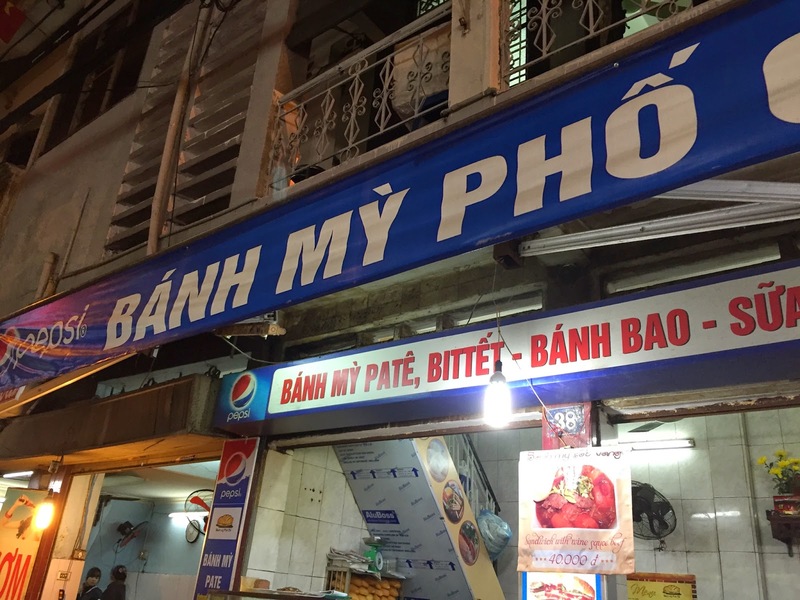 Lotus ordered our monster combo sandwich called "the banh my that cam" from Banh My Pho (38 Dinh Liet). This was the mother of all sandwiches that dare to classify themselves as a Vietnamese banh my. It had pâté, egg, herbs, mayo and a very crunchy baguette. It's amazing how good simple, well prepared street food can taste! This Banh My was definitely a “My Oh My!" public display (despite his request to be cremated). This practice seemed a little morbid to us, but is similar to other communist leaders like Lenin and Stalin. Our guides told us that the body is sent to Russia for a couple of months each year to be "properly maintained." We spoke a little about the country's politics and understood a little more about how the people feel with their current government leaders. But, never a good idea to linger too long talking about embalmed bodies and politics-- kind of an appetite killer. We then made our way to West Lake, a fresh water lake in the middle of Hanoi. Amy confessed that she and Lotus love renting the duck shaped boats, paddling up behind swooning lovers and making kissing sounds behind them — what a couple of tricksters. 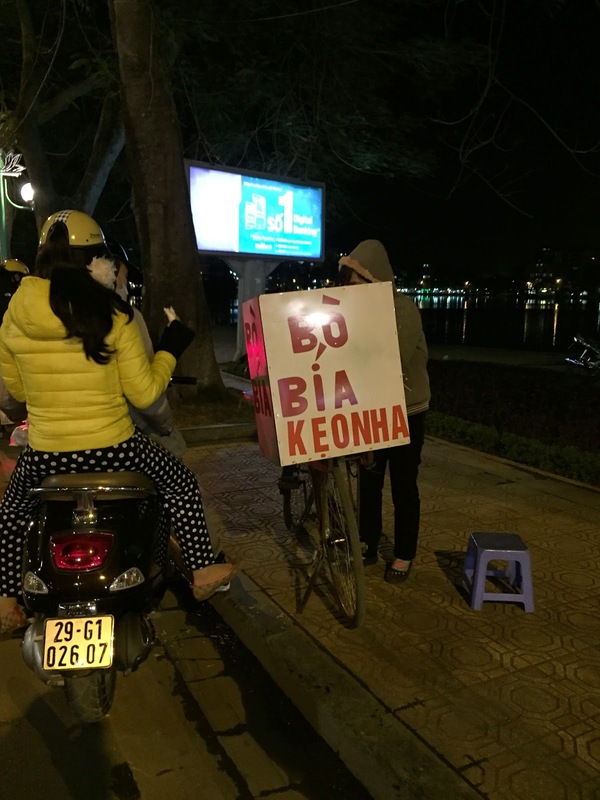 We pulled the mopeds over alongside the lake to try one of the traditional snacks of this neighborhood, Bò bía, or as Lotus translated it for us, coconut cake. 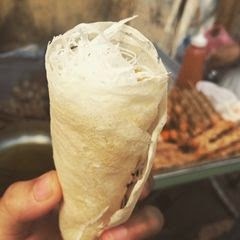 This is a made to order street dessert made from two thin honeycomb pancakes made with sesame seeds and coconut placed on top of the pancakes and then rolled up into a cone shape and handed over as a hand-held treat. We then continued around Truc Bach Lake (Hanoi has several lakes within the city) and passed what Amy called the wealthy neighborhood, where she dreams of someday owning an apartment on the lake. We wound our way past make-shift street fires being used like tiny little campfires to make even more street food. 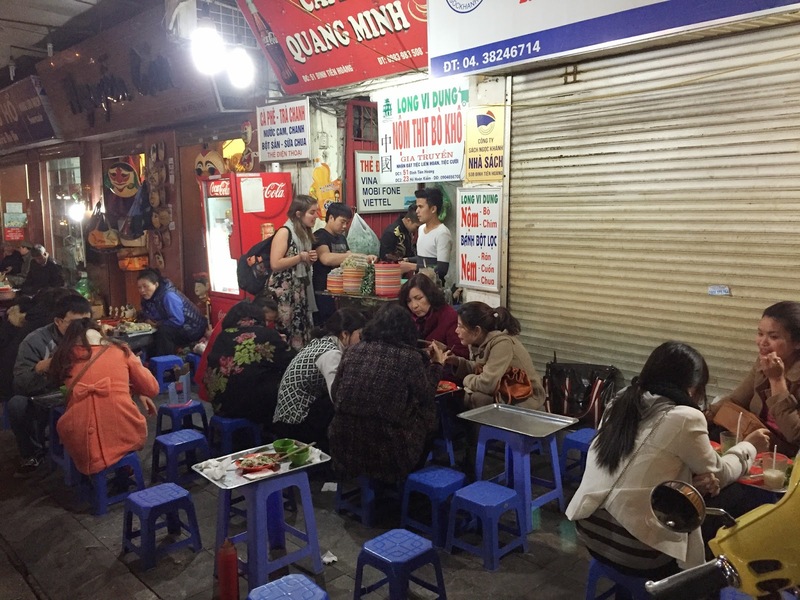 We ended up on Ngu Xa Street to try phở cuon, which is generally found only in Hanoi and specifically in this neighborhood. We noted that certain types of street food are specific to the city, certain neighborhoods and even down to the street level. Unlike traditional phở, phở cuon does not contain broth. 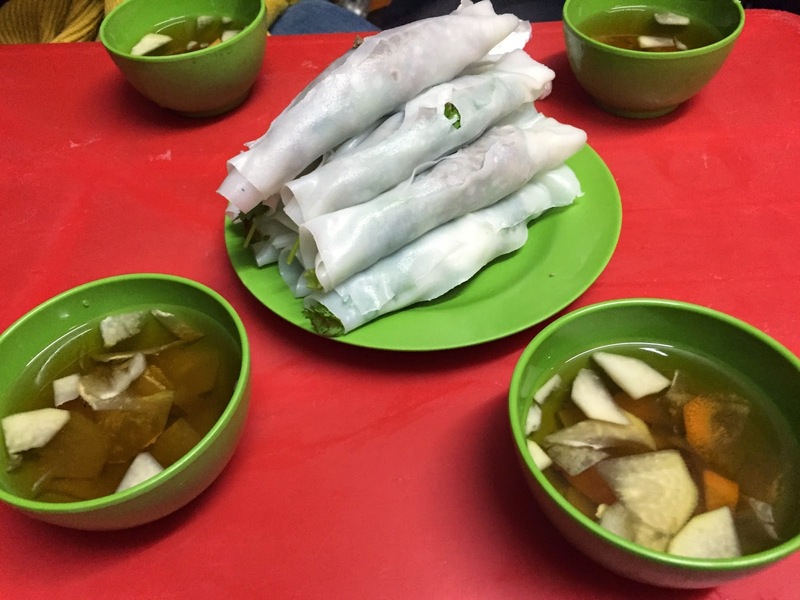 Also, traditional phở ingredients are replaced with fried brief and rice noodles rolled into what resembles a spring roll and served with dipping sauce on the side. Again we found the offering pretty darn delicious! Still going…can you believe it? 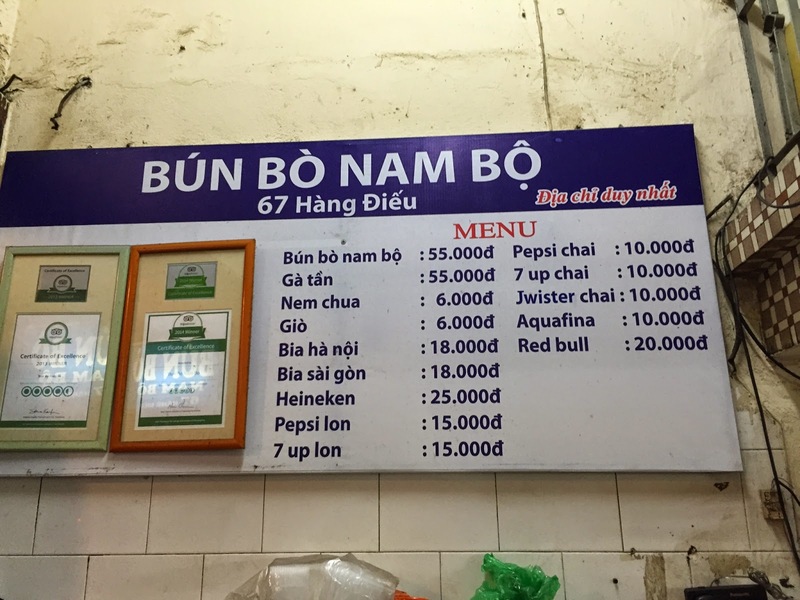 At the next stop (Quán Gốc Đa - 52 Ly Quoc Su) we had a plethora of snacks and by this time we were really struggling to even try another bite— where’s the white flag? 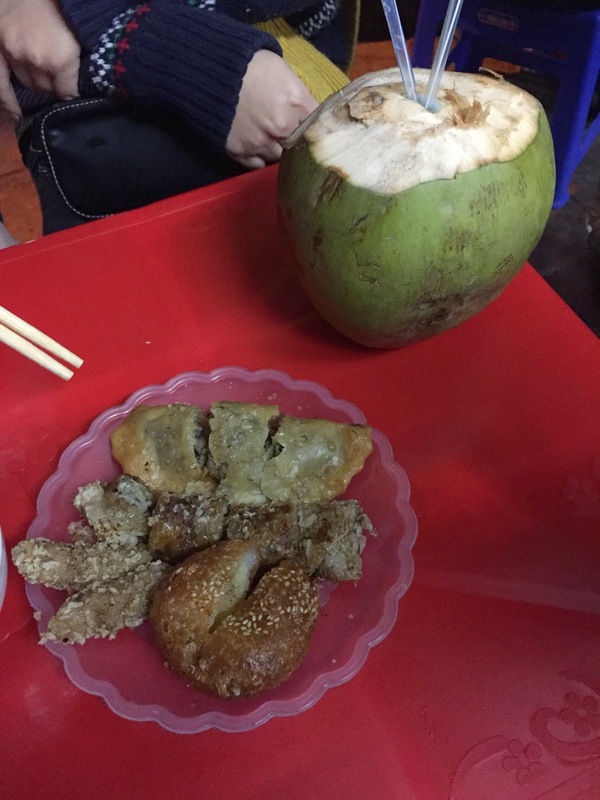 Next for us to try were: bánh gối (pillow cakes or fried dumplings), Bánh rán (a deep-fried glutinous rice ball), Nem chua (fried fermented pork rolls). Our two guides had to help us to eat most of these items, which they were very willing to help with. All these snacks were washed down with local coconut juice. 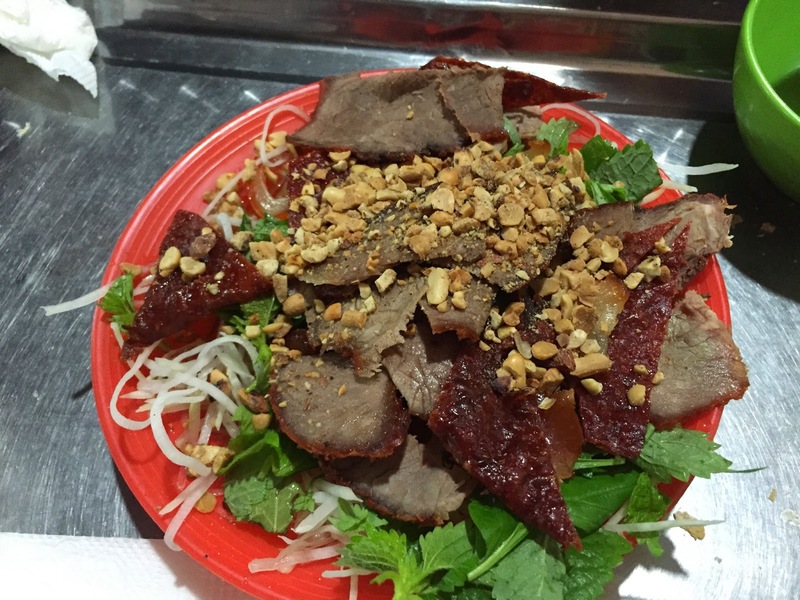 Nam Bộ is also known as stirred beef vermicelli. 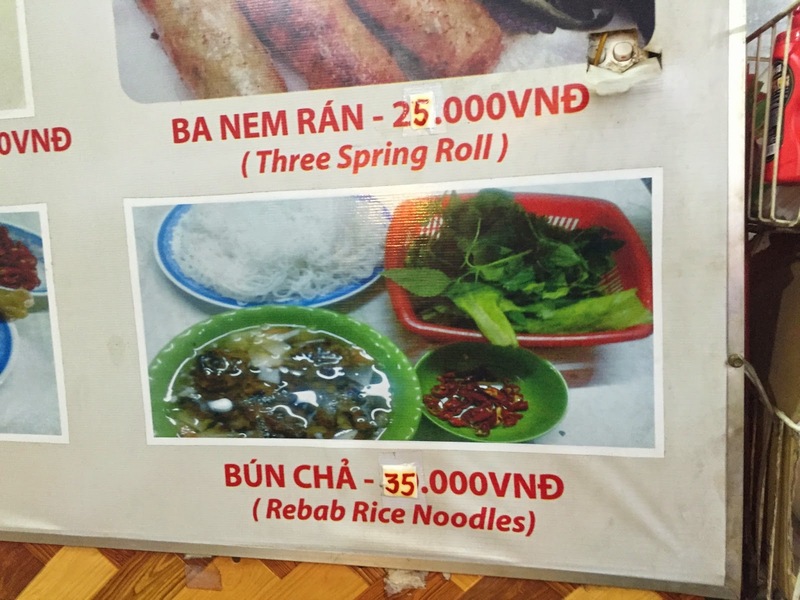 The main difference we noted was the absence of broth, instead the noodles were coated in a fish based sauce. It was more like a salad vs. a soup. But, at this point we were so full we only had a bite or so and had to call it, since we had dessert and coffee left on the schedule. We'd have to do a true comparison another day. 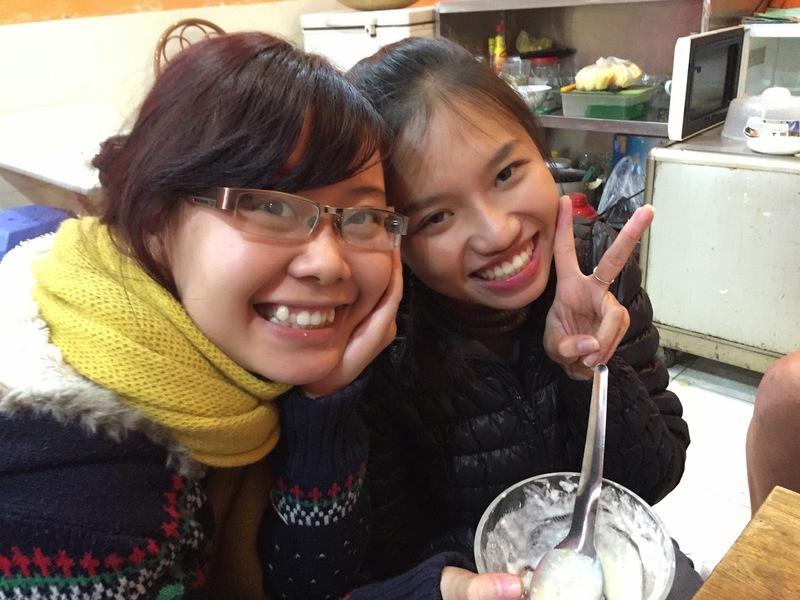 We headed to Sua Chua Mit Hoang Anh (22B Ba Trieu) for some frozen yogurt. We were given no choice, but to try the girls' own yogurt creation dubbed the “chop chop” because of all their additions to the yogurt and how they creatively use chopsticks to mix it all up. 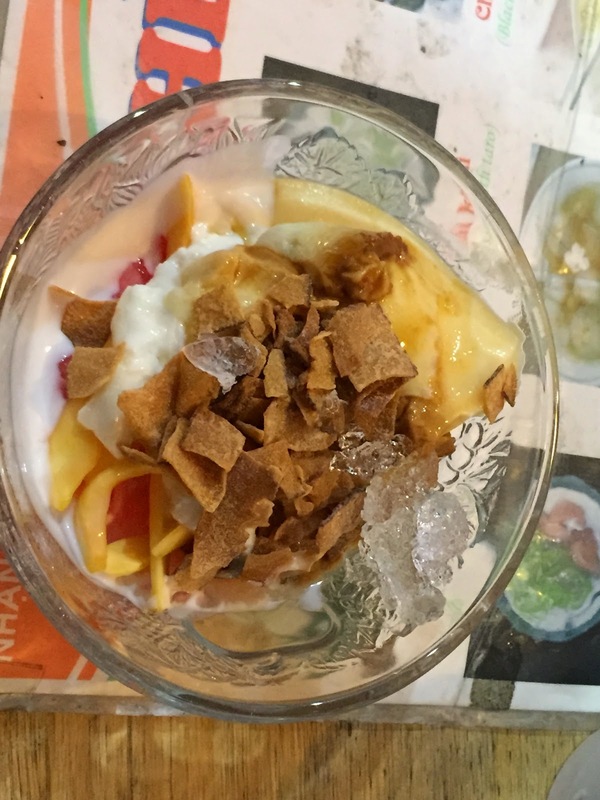 They had some of the tapioca used in bubble tea with yogurt, fruit and caramel. How can you resist saying no to these two? like. 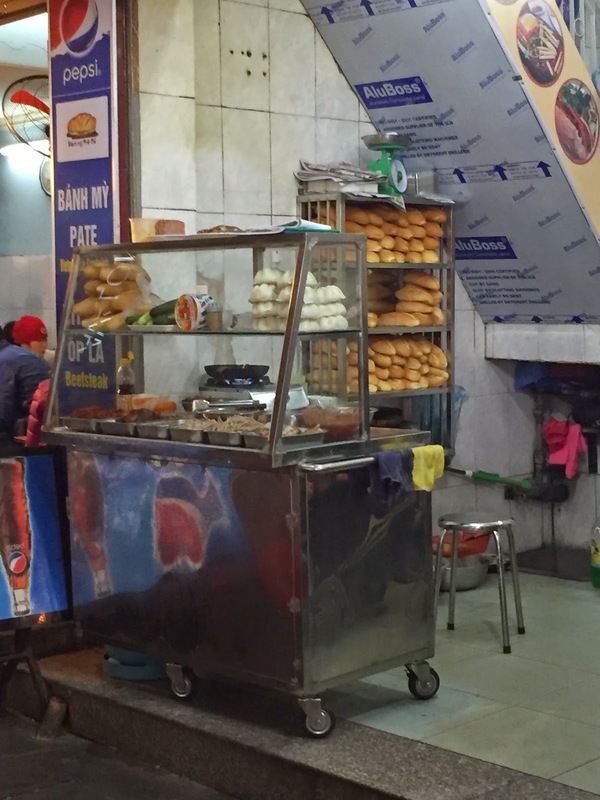 We were glad we had our trusty guides as Cafe Giang is tucked away in a non-descript lane (a bit speak-easy-esk). This is one of Hanoi’s treasures. It was founded back in 1946 by Mr. Nguyen, whose family still runs the place. Amy told us that her grandparents and parents love this place. Mr. Nguyen has kept his egg coffee recipe almost the same as in the early days. 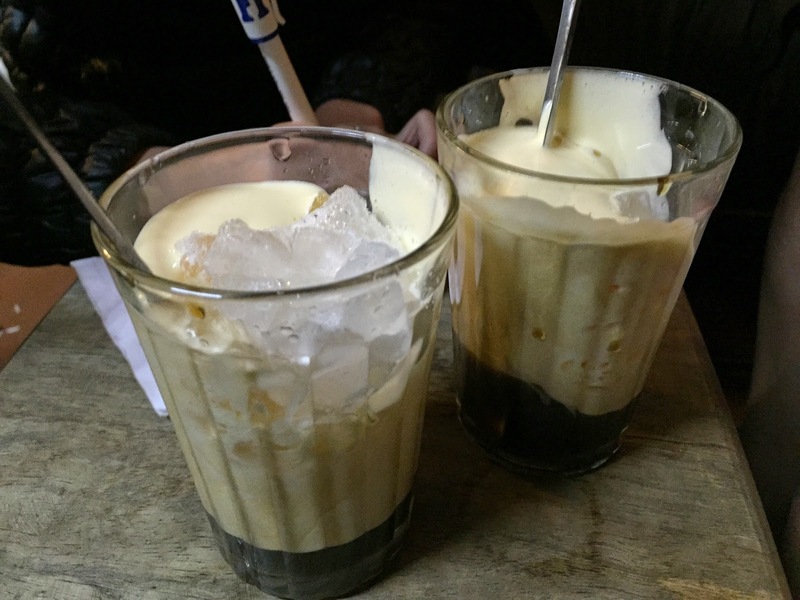 The main ingredients are egg yolk as the name implies, Vietnamese coffee powder, sweetened condensed milk and butter (definitely not the lowest-calorie choice). This coffee was developed due to the scarcity of milk, so egg yolks were used as a replacement for the fat. The yolks are whisked into the other ingredients and then added to the brewed coffee. It became apparent as we climbed the stairs to the 2nd level that this was a very popular place with the locals as there was standing room only. The girls somehow managed to find us a little table to sit at for our egg coffee tasting. As we were chatting with the girls and sipping away we noticed a local man staring at us. Eventually he made his way over through the crowd and introduced himself as our hotel front desk agent. He asked if we were enjoying the coffee. We replied, we found it very sweet, rich and decadent. What a fun coincidence to meet him in a completely different part of the city, which proved the locals really do love this place. 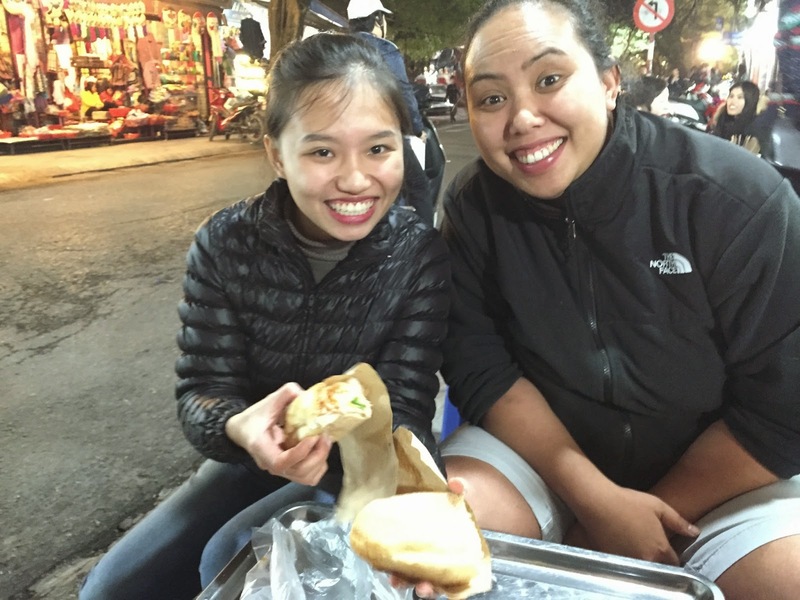 It was also a very fitting way to end our dabble into the street foods of Hanoi. By now, we were stick-a-fork in us done. 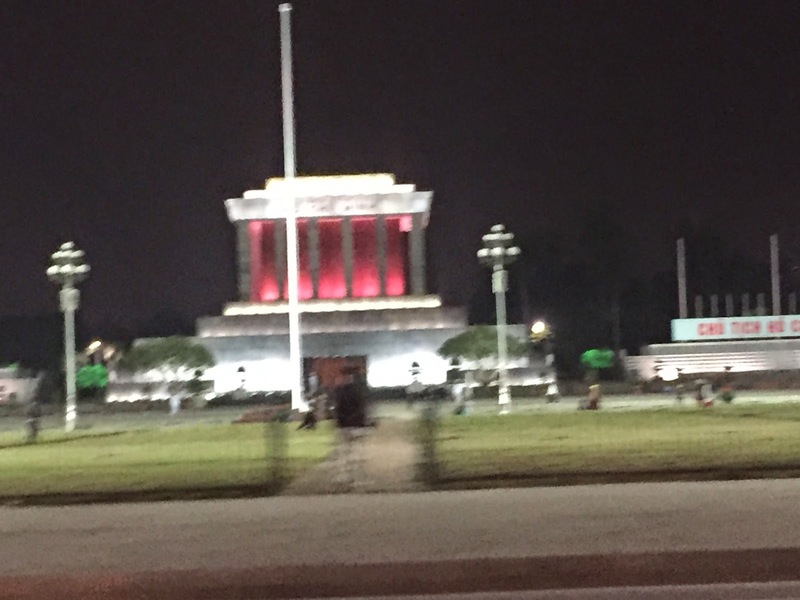 What a whirl-wind tour of this ancient city (Hanoi celebrated it's millennium birthday a few years back). 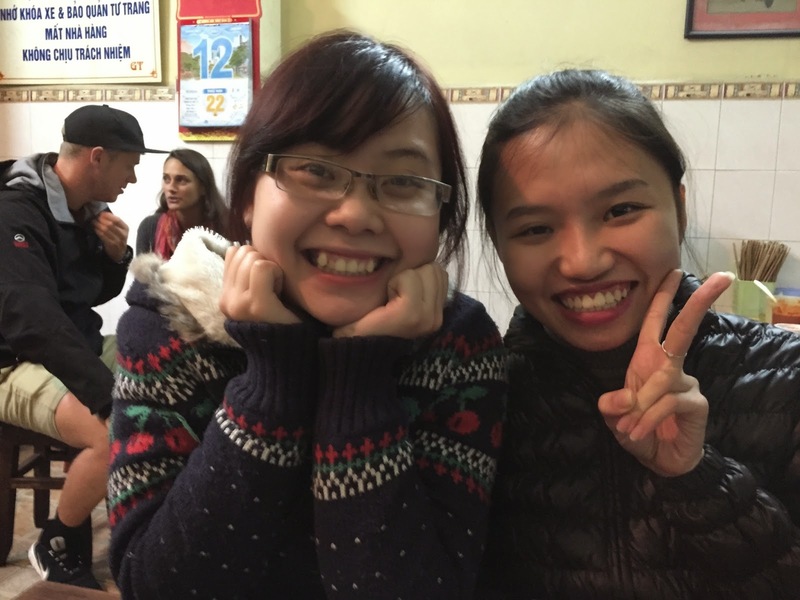 We really enjoyed our food tour and the time we spent with our fun guides Lotus and Amy. There's nothing like being taken to the best spots to eat in the city and learning about the culture and vibe by hanging out with the locals. We definitely came away with a love of Vietnamese street food, in fact we don't know why you would book an expensive fancy dinner here when the street food is so darn good!